Firstly make sure you have read my previous blog “Customising your own panels and more” so you do not get confused by the difference between what I name as a “vertical” and “horizontal” panel. 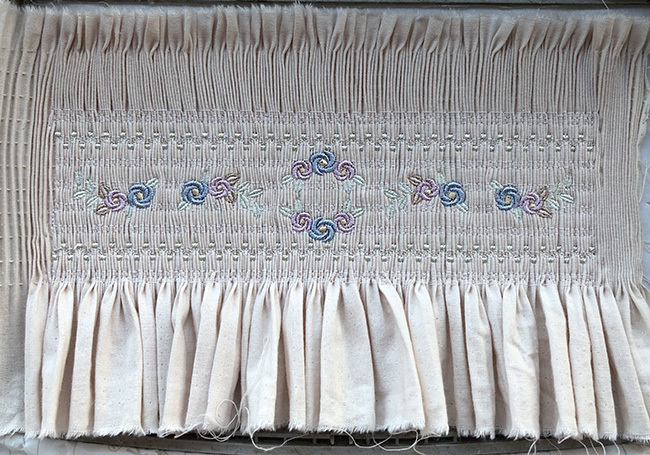 This photograph shows the vertical panel from Pamela Cox’s new Smocking tutorial which shows you how to make a machine embroidered smocking panel and place it in a bolster cushion. Its so pretty and I thoroughly recommend this tutorial. 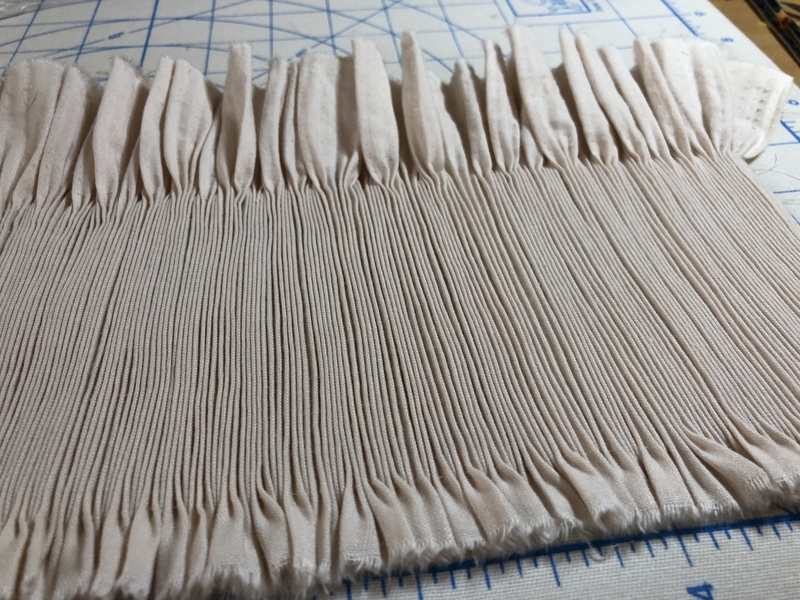 Remembering that a “vertical” panel secures horizontal tucks, (as shown above) that have been created on your pleater or gathered on your sewing machine, the width of this type of panel will be decided by the width of pleated fabric which of course cannot exceed the width of your pleater. A 24 needle pleater will produce panels that are up to 24 cm wide. The panel can be as high as the length of your hoop. Obviously a 32 needle pleater is wider and will create up to 32 cm wide panels. The more common “horizontal” panel which is created for the yokes of babies dresses and rompers holds vertical tucks in place. This type of panel is not limited by the width of pleated tucks but only by the length of your hoop because the design is rotated to it stitch out. Be aware that this rotation adds to both yours and my confusion about“horizontal” panels! In my accompanying PDF’s for Arabella Bullion 2-5, I clearly mark each panel to help you. 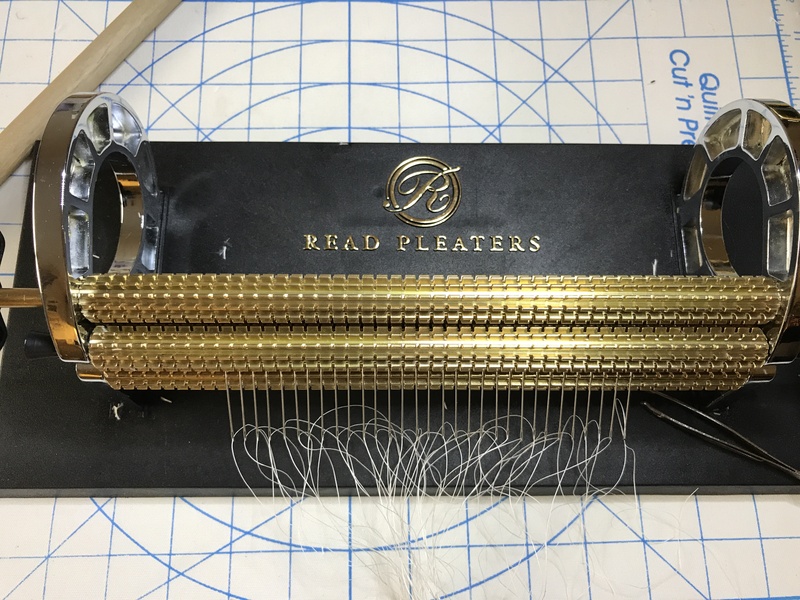 My READ pleater is actually a 24 needle one with an option of adding an extra 23 needles to change the gaps from 1cm to ½cm, which gives more support to the fabric. (All these needles confused me and I thought I had a 32 needle one!) Here you can see all the middle needles threaded so the gaps are just ½cm. 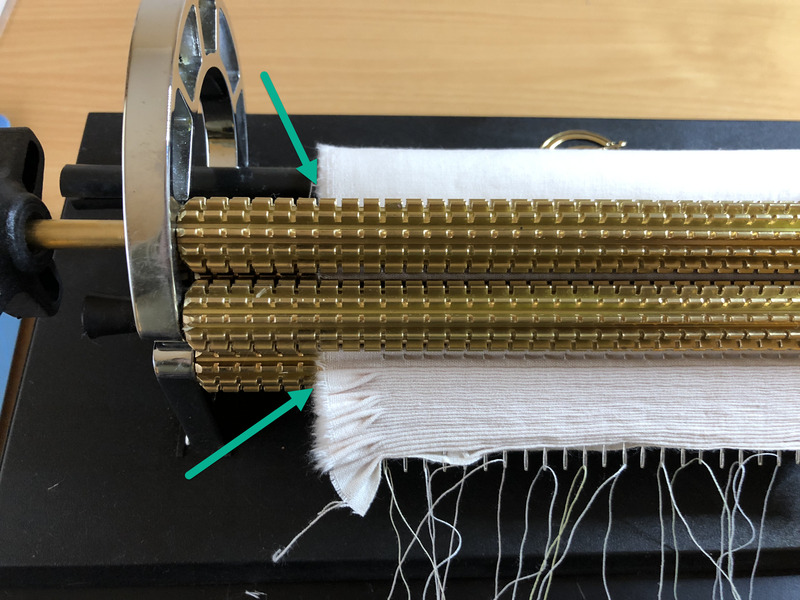 If you use quilting thread as shown in this photo, it is not very soft and is inclined to unravel or become unthreaded, but I have found that ordinary polyester thread will work just as well and it is much easier to thread. Place a book under the front section of the pleater if necessary to lift it up slightly making threading all the more easy. This is also necessary when checking, removing and replacing the needles. I feel that as the pleater does the gathering the threads normal polyester threads are all that is required, especially as they will remain in the embroidery unlike hand smocked panels. I have now invested in a feeder box, which sits underneath. 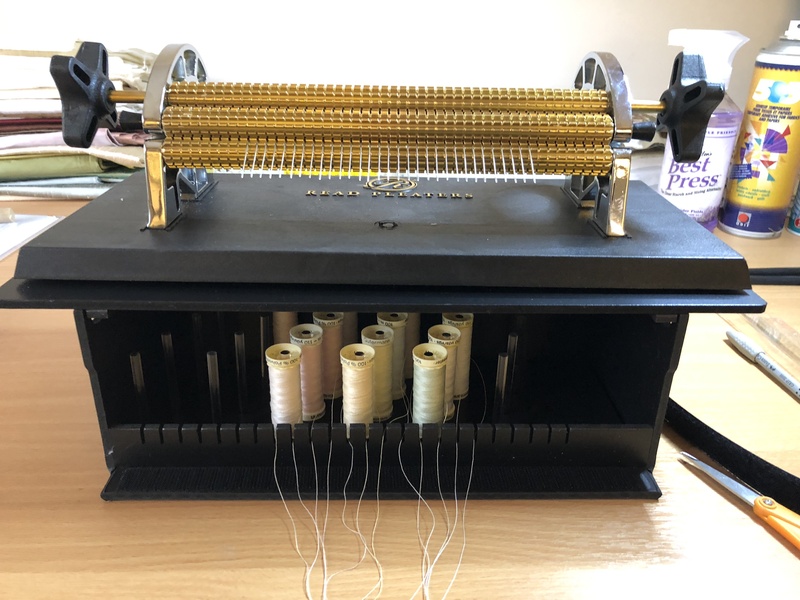 Thread is pre wound on to bobbins that sit under the pleater or small reels of thread can be used. Apparently several panels can be pleated one after another which is my next challenge! A magnetic feed rod makes the job of rolling your fabric easier, so I recommend getting one of these. If you do not want to go to the expense of a pleater you can purchase ready made panels online. I did extensive research watching lots of YouTube videos as my second attempt to use my pleater, on my own, without Pamela was a little difficult. 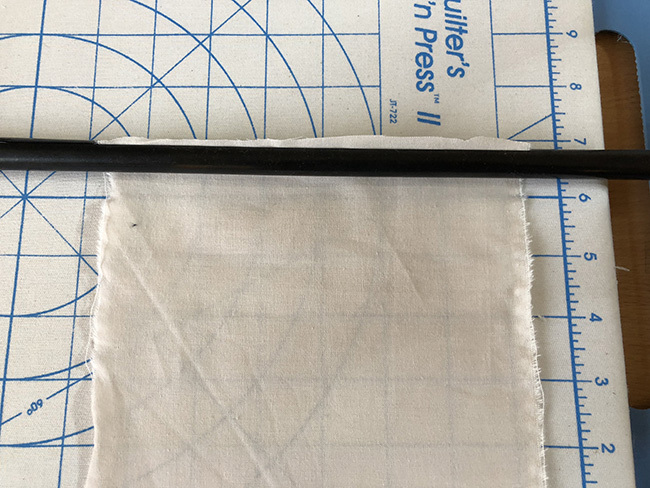 I did not use the little threader which came with the pleater the first time, but decided to do it by hand making sure I cut each thread at an angle to allow it to pass easier through the needle. However since then I I have invested in a Lighted needle threader which makes the threading so so easy! It really doesn’t matter if you thread top down or with a needle threader bottom up but I have to confess this worried me the first time around. 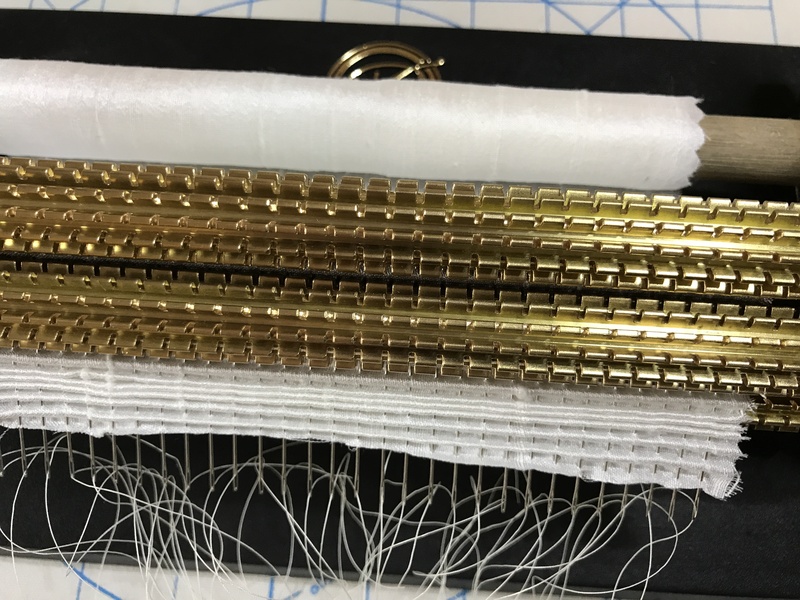 I was frightened that the needles would come unthreaded when I pulled the smocking panel out, but providing I pushed the threads through at least 4″ they stayed threaded and the panel came away easily. Relief! If you are making a 12″ panel thread well over 24″ of thread through each needle. Some people knot the threads in pairs before they begin, others do it afterwards. I use an old crochet hook to help with knotting. As with many methods both work and its down to personal preference. The first attempt is a little weird but once you have it set up, the rollers on the pleater work their magic without effort. You can hear when it is time to pull the fabric off the needles. What wonderful little devices they are – worth the expensive! I have to confess that I am hooked, as the pleated samples look so incredible and I have so many ideas for future embroidered panels. Machine embroidered smocking is so pretty and can be used for much more than just the yokes of baby dresses. Panels can be inserted into cushions as Pamela shows in her tutorial, garments, wall hangings and so much more. Why not place a smocked panel on to a bag or journal cover? 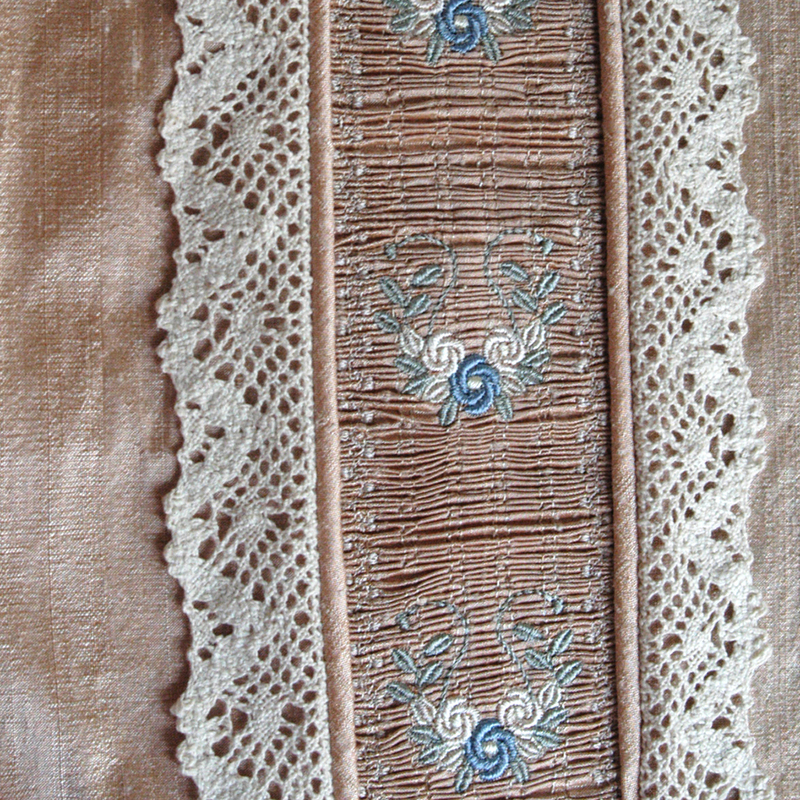 I have seen some lovely examples of smocking on adult clothes on sleeves in particular. How about some smocking panels on a scarf? 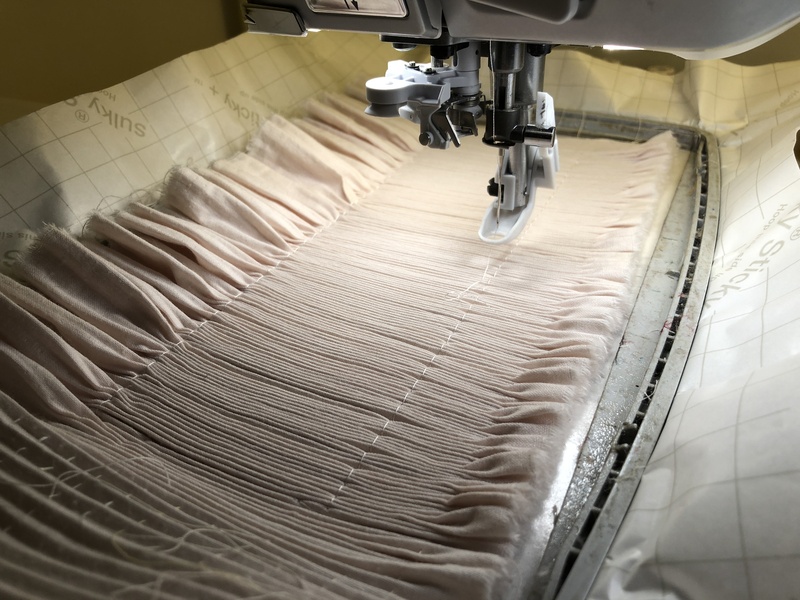 If the area you require to smock is much larger than any smocking panels you can stitch out in your hoops, you can insert smaller ones side by side with a small panel between, or on each side of a garment mirror imaging them. Study these 2 wide “horizontal” panels from Arabella Bullion 3. 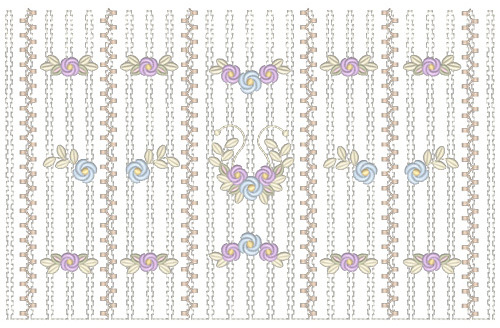 The plain panel appears at first glance to the same as the detailed panel but the rows of embroidery stitches are slightly different allowing you to add your own bullion roses for a unique panel so there are plenty of options for you in this set. I would like to take you through the process of stitching out a panel. 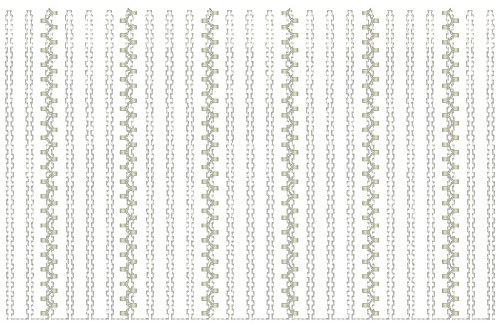 Below you can see an image of GFE-ARB-3-16, a narrow horizontal panel, found in Arabella Bullion 3, with a finished measurement of about 9″ by 3″ and it is the typical baby’s dress panel. 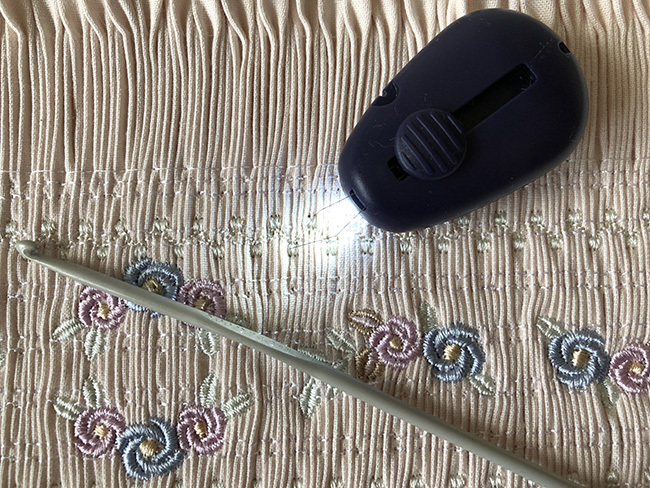 To stitch this out I cut a cotton strip which was 6″ by 50″ as it is a good idea to create a slightly larger panel so you can select the best area for your embroidery. Watching that the fabric keeps aligned at the back is very important so the pleats are evenly spread along the grain of the fabric. 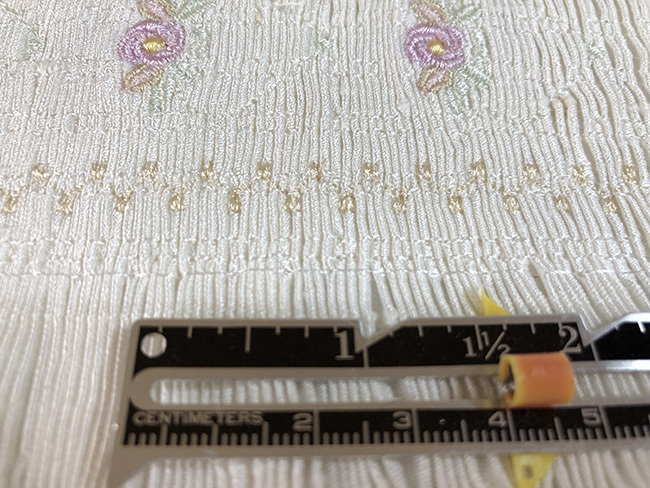 Now you see here that I have only threaded every other needle which worked fine, but be aware the un-used needles at the edges do leave holes in the fabric. You may be wondering as I did how tight to make the pleats as I did. This previous panel shows the pleats to be about 20 per inch but it is quite tight. You will need to pleat about the length of the panel x 5 to get this much tightness. Best to make the panel too large than too small so I pleated about 50″ for the design. The finished panel needs to be carefully tied at each end and the pleats made as even as possible. Take your time with this. I marked the centres on my hooped Sticky back stabiliser, and carefully laid the panel on top. If you are worried about drawing on the sticky surface take the hooped stabilizer to your machine and use the needle to mark the corners and the centre. Once the pleated fabric is applied I move the needle of my machine to each corner of the design again just to make sure I have the panel straight and in the best location. Attach the design with the square outline alignment stitches or the basting box on your machine. Before you start the embroidery remove from the hoop and check that everything is straight and aligned. The top and bottom should have sunk nicely into the pleats. This is how the holding stitches cover the pleats. I have selected a pale colour so they blend into the fabric but you may prefer to make them bold by using a contrasting colour. I inadvertently stitched the embroidered stitches in pale green twice and they look so much better so you may want to consider this option. Don’t you love it when you discover something new when you make a mistake! I can see this would look so beautiful on a baby’s dress and I cannot wait to do my next panel. It will be so much fun creating more lovely panels. Watch this space. This entry was posted in Discussing machine embroidery, New Designs and tagged heirloom embroidery, machine embroidery, Smocking designs. Bookmark the permalink. This is beautiful. I do not have a pleating machine, but you mentioned the panels can be purchased. I want to try this! 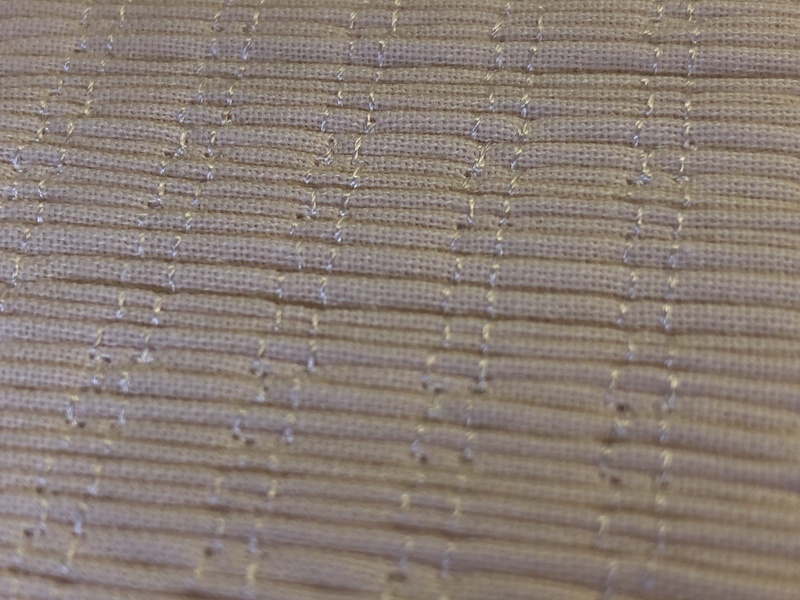 It is possible to gather smocking panels on your machine using rows of large basting stitches. Pamela shows you how to do this in Tutorial 9.